As a young child I remember looking forward to the evenings when I could watch Little House on the Prairie. It was one of my favorite shows. When I learned about a new documentary by Legacy Documentaries titled Almanzo Wilder: Life Before Laura, I was very interested in watching it with my two sons. I was also excited to learn that Dean Butler, who played Almanzo on the T.V. show, is the Executive Producer of this DVD and also the host and narrator. The DVD, which is about an hour long, is broken up into two sections: Life Before Laura and Wilder Homestead Today. 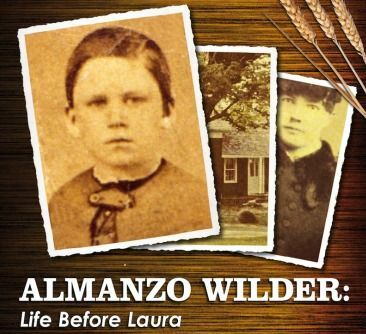 Almanzo Wilder: Life Before Laura shares with us the story behind the little boy named Almanzo Wilder, who was made known to many through the book Farmer Boy, written by Laura Ingalls Wilder. In this documentary, Almanzo is portrayed by several actors at various stages of his life, including the time he met and courted young Laura. The scenes were re-created on location at the Wilder Homestead, Almanzo's original home. This production offers a historical overview about how the people lived during the late 1800s, including which behavior was acceptable or not acceptable, what it was like to live and work on a farm, and how families interacted. My oldest son was appalled at their custom of not being able to do anything on Sundays except to sit for hours until they were once again allowed to go back to their chores. I enjoyed listening to the stories behind some of the sibling squabbles they had and how in the end, each showed their love for each other. Throughout the DVD images from the Farmer Boy are included as you listen to the retelling of certain sections of the story. The Wilder Homestead Today section gives you a tour of the Wilder home, which was restored to look like the original home and is located in Burke, NY. It includes scenes from some of their educational programs as well. The cinematography throughout the program was excellent! The scenery and the vibrant colors throughout this DVD made it very pleasing to the eye. At the completion of the documentary, I was left with the desire to take my sons to New York to physically visit the Wilder Homestead. Also, since my children have never read the book Farmer Boy in its entirety, we will be taking the audio book version with us on our next long trip. I look forward to listening to the story with my sons. Viewing the DVD beforehand will make it easier for us to picture the scenes from the story. As a homeschool parent, I recommend this DVD as a great supplement to any American History program teaching about the mid-1800 era. This program is suitable for all ages, although more specifically geared for ages 8 - 12. My children, ages 7 and 12, both enjoyed it as the documentary was very engaging. To read what others on the Crew had to say about this product, click on the banner below.